Panasonic announced the Toughbook CF-19mk5, a new rugged convertible notebook with the Intel Core i5-2520M processor. Panasonic today announced the Toughbook CF-19mk5 with more than double* the system performance, improved usability and unique new screen visibility technology. In field utilities, emergency services, defence, transport maintenance and a huge range of field services, the Panasonic Toughbook CF-19 is transforming the way professionals work by providing access to data and applications, wherever and whenever those professionals need it. As the market-leading outdoor convertible notebook PC, the CF-19 is the benchmark fully rugged notebook, built on 15 years of Panasonic Toughbook experience. System performance in the latest CF-19mk5 device has been doubled* with the inclusion of second generation high performance Intel® Core™ i5-2520M (2.5GHz) standard voltage processor with Intel® HD 3000 graphics, ensuring the device is capable of handling the most intensive applications. This is the first time a standard voltage CPU and Intel® HD 3000 graphics have been included in the CF-19 and still without the need for a fan, ensuring reliability in a challenging environment remains a priority. As well as the new CPU, the CF-19mk5 also comes with 4GB RAM as standard with a 32bit or 64bit Windows 7® professional operating system bundle. Different Hard Disk Drives are also available with 320GB (5.400rpm) in the Standard model or with optional 128GB SSD or 256GB SSD and 500GB (7200rpm) available on a request basis. The CF-19 always ensures the screen delivers just the right level of brightness for easy vision whatever the conditions. To deliver the best 10,1” screen visibility on the market, the mk5 generation of the CF-19 uses Panasonic Transflective Plus technology. This incorporates circular polarizer to reduce reflection. This operating mode helps to reduce power consumption and enhance battery life as no backlight is required in bright environments. This results in a massive enhancement of up to 6,500nit of transflective brightness under an equivalent 200K lx environment. The CF-19 also includes the new Dashboard for Panasonic PC designed to simply and conveniently customize each Toughbook to the user’s preferred settings, providing a user- friendly quick launch interface. The Dashboard also allows easy management of the device using helpful tools, such as the popular Panasonic Power Plan extension Utility and PC Information Viewer utility. The CF-19 also comes with a Concealed Mode for use in mission critical environments. 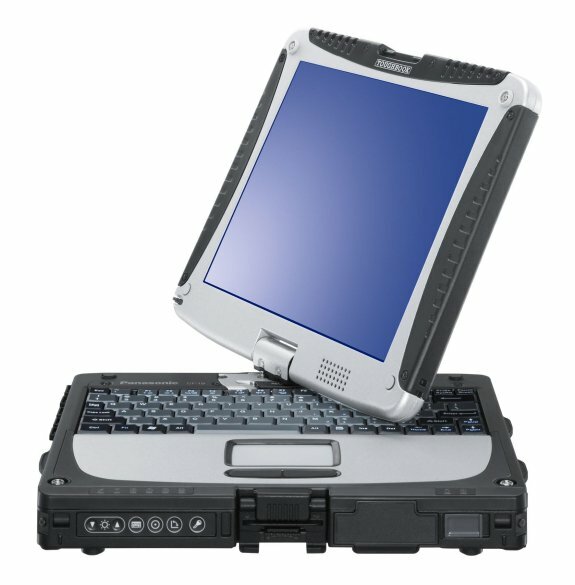 Using this feature, the Toughbook can go into “silent mode” by disabling the backlight, status LED’s, speakers and communication (3G, W-LAN and Bluetooth) as specified. Ensuring mobile workers can always stay in touch when on the move, the Toughbook CF-19mk5 offers an optional Ericsson F5521gw HSPA+ (DL: 21 Mbps) module with wireless ready connection manager. It also includes a dedicated wireless switch allowing users to switch connections on and off to improve operating time. Available upon request, the device can also be switched into Anti-Theft-Protection mode by utilizing the latest Intel® ATP technology. To ensure that field technicians and engineers have a device that can work for as long as they do, even when access to power is lost, the CF-19mk5 can operate for up to nine hours running on Windows® 7. With magnesium alloy casing, inside and out, and Panasonic’s anti-scratch coating, the CF-19mk5 remains the toughest rugged notebook in its range. It is MIL-STD 810G drop tested and has water, dust, vibration and temperature protection giving it an impressive IP65, MIL STD 810G rating. With an HDD damping and rugged casing systems to optimise drop protection and an HDD heater and Panasonic’s foam packing system to provide flexible seals, the CF-19 can operate in even the harshest conditions. To ensure existing customers can continue to use the peripheral equipment, the new CF-19mk5 is compatible with almost all previous CF-19 car mounts** and other peripherals such as docking stations** and batteries in order to provide long term product lifecycle stability. The CF-19mk5 range is available from June 2011, starting at €2950 MSRP (excluding vat).